Learn to Weave a Simple Miniature Baby Basket for a Dollhouse Nursery. This dollhouse miniature weaving project for a baby basket is easy to do, and uses only simple materials. To complete the dollhouse baby basket you will need graph or squared paper, paper covered wire, crochet thread or quilting thread, fine ribbon and strong glue (The Ultimate or a similar glue good for jewellery findings or cyanoacrylate (krazy) glue). The same basket design can easily be made to a custom size for nursery shelves, to hold laundry, linens or clothes. It can also be adapted to use as a design for a pet basket. To custom size the basket to suit your scale, see the information on How to Design Custom Miniature Baskets. 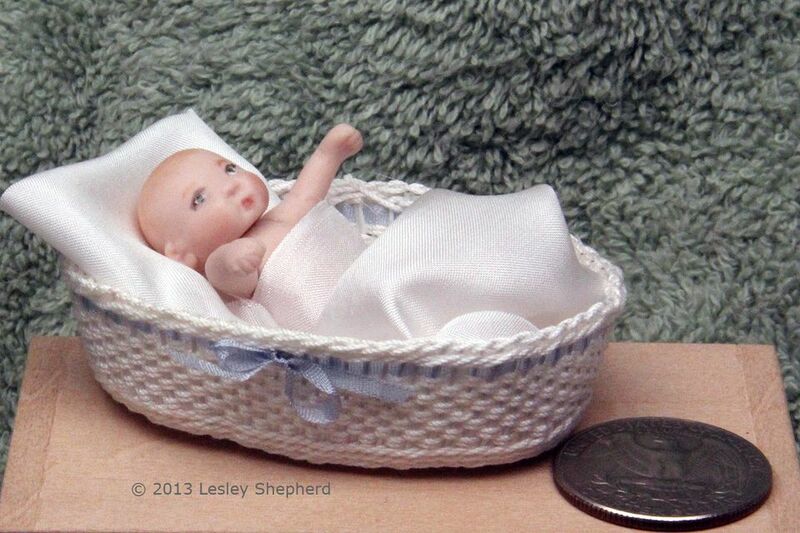 The basket shown here with a 1:12 scale porcelain baby was made from 28 gauge paper coated wire (Hanky Panky Crafts) and size 10 crochet cotton (bedspread cotton). To make this particular basket, I laid out 11 base wires which are roughly 4 1/2 (11.5cm) inches long (the up and down group in the photo) and set 28, 3 1/2 inch (9 cm) long cross wires across the base wires, taping 5 wires every 1/4 inch (7mm) using gridded paper as a guide. The base of the basket in 1:12 scale is an oblong roughly 2 1/2 inches (6.5cm) long by 1 1/4 inches (3.2cm) wide. If you are not fitting your basket to a particular doll, draw out an oval on graph paper as a guide.I set my wires in the photo on top of the up and down wires, but the basket would work better if wires were set alternately over and under the long central wires. With the wires set in place according to the grid, a bit of glue is applied to the central wire section to hold it secure so you can start weaving. Use either a thick glue like "the ultimate" or cyanoacrylate (rocket or crazy glue) to hold the wires in place in the central section. Once the cross wires are glued to the lengthwise wires, the assembly is lifted and "pairing" is woven over the wires. Pairing is the method of weaving a figure eight over wires so that each wire is surrounded by a threads on either side, which are crossed on either side of the wire. Follow the link above to see a clear example of the pairing weave. To begin with, two rows of pairing are worked around the base wires as shown in the photo above. The 11 long central wires are paired in groups of two, two, three, two, two on either end of the base, while the cross wires are paired in groups of three at each corner of the central wires (see photo). The pairing should hold the central wires and cross wires securely together to form the basket base. I generally cut three foot lengths of thread for my weavers and fold the thread in half, looping it over one stake to hold it in order to begin the pairing weave. Once the first two rows of pairing are holding the wires in place for the base, you can begin to work pairing over each individual wire, breaking up the groups of length wise central wires, and the three wire groups on the cross wire 'corners'. As you pair each wire individually, move these previously grouped wires out to the ends at an angle, so they begin to define the oblong shape of the basket base (see photo). If you will be doing the weaving pattern shown in the instructions, which uses 'randing' a simple over under weave in the next step, you will need to add in an extra stake or wire as randing requires working over an uneven number of stakes. Set an extra wire into one "corner" of your basket so it runs down beside another existing wire. Pull the new wire out at an angle so it is spaced even with the other wires. Work at least three more rows of pairing to hold the wires in their new spaced positions, taking care to space all the wires evenly around the base of the basket. Trim the wires so they form the shape of an oval once your rows of pairing are completed. Keep the wires as long as possible. With the wires evenly spaced, and three more rows of pairing completed, you can change to a 'randing' weave to fill in the basket base if you wish. Randing is the standard weaving process of going in and out between the wires or stakes. For my baby basket, I used a double strand of thread for all randing, looping crochet thread around a 'stake' or wire, then going in and out with both ends of the looped thread between the wires, keeping the two threads flat together and preventing them from twisting. Take care to push the randing into the base wires to keep the weaving tight and avoid gaps. Once you have the base of your basket so it fits your baby (see photo) or the oval you drew on graph paper in the second step, test fit your baby above the basket base to make sure the base is the correct size. You can see the "basket weave" pattern produced by randing double strands of thread on the outside of the basket base in the photo on this page. Note: If your strands of weaving threads run out, leave the ends on the inside of the basket and overlap the weave slightly with a new set of threads (whose ends are also loose on the inside of the basket). When you go to finish the basket, you can cut the loose ends free and glue the cut ends into the weave of the basket interior. Once the basket base is finished, carefully turn up the wires at the edge of the base so they are at right angles to the base. Take two, three foot (1m) lengths of thread, fold each in half, and loop them around adjacent stakes (wires) as shown in the photo on this page. Baskets with a woven base are always given a 'footing' to transition to the sides, formed by a 'four rod wale', a particular pattern of weaving that gives a thick twisted edge. To form the four rod wale at the base of your basket sides, take the farthest left thread of the four ends you set up in the last step, and take it outside of the basket over three wires, the back into the basket and out again around the fourth wire. Take the new farthest left thread and go in front (outside of the basket) of three wires, the into the basket, and back out around the fourth wire from where you started. Continue this process until you have gone completely around the basket. Make sure you keep the weaving tension even so your 'four rod wale' makes a neat, tight footing for your basket base. When you have finished the four rod wale, cut off (or take into the center) one of the weaving threads, leaving three of your four threads. Continue another row of waling, this time with only three threads, going across in front (outside) of two wires, then into the basket and around the third wire and out to the outside again with each thread, working always from the thread on the left. You can work two or three rows of three rod (three thread) waling on top of your base four rod wale. Once you have finished the waling rows, change back to a double strand of thread and work in randing weave (simple in and out) until you reach just below the height you want for your basket. To decorate your miniature baby basket you can add rows of decorative ribbon. I used fine silk ribbon (2mm / 1/8 inch) from Katy Sue Designs. Start your ribbon row on the side of your basket, leaving enough of an end to allow a bow when the ribbon randing is complete. After weaving in the ribbon, tie a neat bow and trim the ends of the ribbon, treating them with fray check or glue if necessary. Always cut ribbon ends at an angle for the most elegant finish. With the ribbon row in place, finish the sides of the basket with a row of three or four rod waling above the ribbon row. Reduce your threads to three leaving the ends of your threads long after you complete the final row of waling. Trim the ends of the wires with end cutters or kitchen shears down to just above the final row of waling. Apply a bit of glue to the top run of threads between the wires, using a scrap piece of wire or a toothpick. Leave to dry. Make sure you apply glue only to the of the threads, not to the sides of the basket. When the glue between the wires on top of the waling row has dried, braid your three remaining thread ends until you have a length of braid which will go completely around the basket set along the upper basket edge. Apply glue to the top edge of the basket wires, and gently press the braid in place to cover the cut wires. Allow the glue to dry. Trim off the end of the braid, gluing the cut ends so they blend neatly into the top braid. Trim any threads on the inside of the basket and glue them neatly to the inside of the basket. Allow to dry. Experiment with round and oblong (oval) basket shapes for a range of uses in your dollhouse or miniature shop. The more baskets you weave, the better your end products will become! Instructions for more simple miniature weaving projects.